Across most of the arid West, drought has been the norm for the last 18 years. The majority of young farmers and ranchers in this region have never farmed in non-drought conditions, which means they are uniquely focused on creative solutions to water conservation. In 2016, NYFC produced a report and a short film, both titled Conservation Generation, that paint a picture of these young farmers, their approach to water, and the challenges they face. We also followed four farmers in Colorado and New Mexico as they shared their water stories throughout the growing season. Join NYFC today and become a part of our work to support young farmers and protect water in the West. 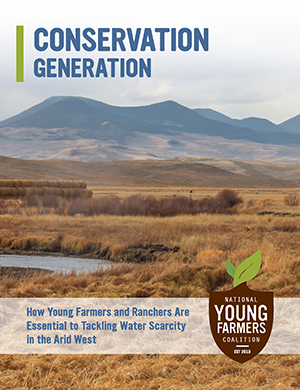 NYFC’s report, Conservation Generation: How Young Farmers And Ranchers Are Essential to Tackling Water Scarcity in the Arid West, is based on a survey of 379 young farmers in the arid West as well as conversations with eight farmer focus groups. The report also outlines a series of recommendations to better support young farmers that includes protecting irrigated farmland, increasing education and outreach to the young farmer community, strengthening incentives for on-farm water conservation and efficiency, and elevating soil health as an essential tool for resilience. Interested in hosting a free screening of Conservation Generation? Tell us about your event and we’ll help you get started. Three years ago I made my first fruit sale from my family’s orchard in Colorado. It was my first year managing a fruit crop after years of farming vegetables for a CSA in North Carolina. That first year, friends, family, and community members assembled from across the state to pick and store ton after ton of plums and cherries. The crop was bound for a fermentation start-up business in Boulder, CO called Ozuke. KEEP READING HARRISON’S STORY. When we found our farm, my fiancé Kendra and I knew it was the right fit for us. It had plenty of run-down pasture for grazing animals, lots of semi-flat terrain for crops, a barn and corral that were in shambles, a defunct farmhouse that was livable, and—most importantly—lots of water. When we realized how much water was tied to the property and that much of the irrigation infrastructure was already installed, we got excited. When we found that the water comes from Mt. Hesperus (the Northern Holy Peak for local tribes), we knew that this was the spot to build our future in a dry region. KEEP READING TYLER’S STORY. I’m Nery Martínez, a Guatemalan guy. When I came to the United States I was 18 years old, and I had never done any agriculture work, not even in my country. Honestly, when I was in Guatemala I didn’t help my grandpa clean his small corn and bean fields. I never thought that I was going to be farmer. Over five years ago I came to New Mexico to spend time with my aunt and her husband, Don Bustos. Don owns Santa Cruz Farm & Greenhouses in Española, New Mexico, which is a six-acre vegetable farm that has been Certified Organic for more than 20 years and has been farmed by the same family for over 400 years. KEEP READING NERY’S STORY. Red Tractor Farm is a woman owned and operated two-acre vegetable farm in Albuquerque’s South Valley. We have a 40-family CSA, sell at Albuquerque’s largest farmer’s market, and are proud members of the Agricultura Cooperative Network. The two women who started the farm are growing older and have agreed to be my mentors in assuming eventual ownership. We have been working together for three years now, and each year I assume greater responsibility. KEEP READING CASEY’S STORY.